The “5 W’s” are questions that are often considered the basic information gathering in journalism: the Who, What, When, Where and Why. They constitute a formula for getting the complete story on a subject. But in the event your garbage disposal stops working, you don’t have to ask five questions, you only need two! When did it happen? Did your garbage disposal go down while you were running the dishwasher or a number of other electrical devices at the same time? Did it stop working after a brief or long-term electrical outage? If that is the case, check to see if the reset button (generally on the bottom of the disposal) has popped out. If it has a cord, make sure it’s plugged in and not damaged. The last thing to check is your circuit breaker or fuse. If this does get your disposal working, you may have a deeper issue. What was happening? If your garbage disposal stopped working when you or someone else was using it, ask what was happening it stopped working. If disposing of food, such as piece of bone or fruit, it may have got stuck between an impeller blade and the drain hole. If that is the issue, unplug the disposal or turn off the breaker. Try to remove objects with tongs or pliers (never use your hands!) or put a short broomstick into the disposal and try to rotate the impeller back and forth. If that does not solve the issue, your disposal may have to be removed and taken apart to clear the jam. If you can’t get your garbage disposal to work after this basic troubleshooting, it’s time to call in a professional. NC Plumbing Services provides garbage disposal repair in Raleigh, Durham, Chapel Hill, Wake Forest, Cary, Garner, Clayton, Apex, Fuquay-Varina, Holly Springs and beyond including the counties of Wake, Harnett, and Johnston. 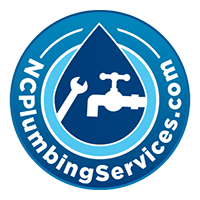 Call NC Plumbing Services at 919-868-3585 to take care of your plumbing needs at a price that respects your budget. No Replies to "Garbage Disposal Repair: The 2 "W"s"